How do you make YOUR dry soup mixes? Some folks make a big batch of thick soup, going easy on the water, and then spread it on dehydrator trays to dry into brittle sheets. Then they pulverize it into powder. Other folks combine dried meats, vegetables, and starches – like rice or potatoes, and add a bouillon cube for extra flavor. Bouillon cubes and ramen noodle seasoning packets usually have ingredients like MSG which don't sit well with some people. Try Edward & Sons Natural Bouillon Cubes. They are made in Switzerland, but you can find them at Amazon. See link at bottom of page. 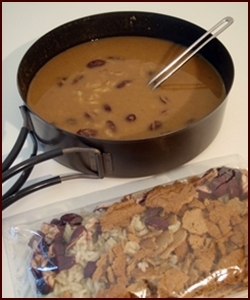 I create dry soup mixes by combining potato or bean bark with added dried vegetables, meats, and beans. Grind the bark into a powder or pack it in pieces. I keep my bark in pieces in case I feel like snacking on it dry. Bark dissolves in hot water and will make your soup thick and flavorful. A two-to-one ratio of water to dried food is usually good for soup. Adjust the amount of water up or down to your own tastes. BackpackingChef.com readers come up with some great recipes. I will post your recipes for dry soup mixes on this page. Put on your chef hat and fill in the easy form to share your recipes for dry soup mixes. Thank you! Use a blender to mix all ingredients till they are smooth. Dehydrate until very dry. Powder in a blender. Package in baggie or other container when taking it on the trail. I store it in a pint mason jar in the pantry until needed. Add three heaping tablespoons soup powder to a cup of boiling water and stir well. Garnish with fresh cilantro and sour cream if desired. Dip a flour tortilla in the hot soup, enjoy. Pack all dry soup mix ingredients in a plastic bag. Consider packing tomato sauce leather in a separate plastic bag if it feels tacky. Rehydrate with about three cups of water. Add seasonings, and pepper sauce to taste. This is a favorite recipe of mine on and off of the trail. *you can substitute pasta or cooked dehydrated potatoes for rice. Put all ingredients into container- I prefer vacuum seal bags for longer storage, but a freezer bag or canning jar works. Add 2¼ times the volume of water to dry ingredients. You can add boiling water to ingredients in a freezer bag, or heat water and ingredients together in pot using any means- a MRE heater, pocket stove, gas burner, or even an open wood flame. Bring all but the cilantro and lime to a good simmer. When the vegetables are soft, whiz it up with an immersion blender. Blend in the cilantro and lime last when off the heat. For dehydrating purposes, dial back on the chicken stock and add chicken bouillon so that there is less water to evaporate. Spread/pour onto solid trays and dry until brittle. Pulverize or powder for instant soup. Serving Sizes: Package into desired serving sizes, ½ cup for one cup (8 ounces) of soup, 1 cup for two cups (16 ounces) of soup. Combine soup powder and water in pot and bring to boil. Remove pot from stove and let sit for ten minutes. Two parts water to soup powder works well, but you could start off with less water for thicker soup and add more water if necessary. Pack potato bark and dehydrated french style green beans in one baggie. The pouch of chicken would be by itself and the packet of flavor boost chicken by itself too. I used my esbit stove and pot. I put the water in and all ingrediants in a 2-cup pot. I lit the esbit fuel tabs and put the pot on stove. It took about 10 minutes to bring to a boil. I let it boil for another 4 minutes. I took the pot off the stove and let it set for an additional 10 minutes. I came across your potato bark recipe. For my own experimental purposes, I added beef broth to about 4 cups of mashed potatoes. I blended it to a smoothie like concistency, spread it onto my pans and dryed it in my oven. I set my oven at the lowest temperature and propped the door open with a dish towel and dried it for about 8 hours. Came out perfect, tasted good on its own and was even better eating it in the meal. Dehydrating Food. All the tips and techniques you need to make bark and learn how to dry meats and vegetables. 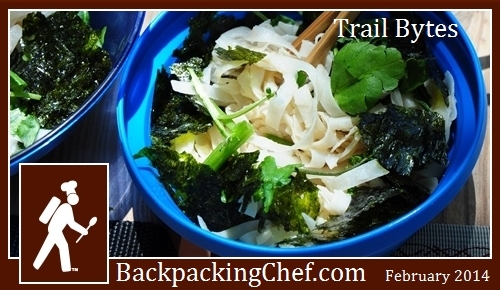 View more Reader Shared Backpacking Recipes. and get a regular supply of food dehydrating ideas and recipes.